IoT development made easy, using pure web technologies. I originally came across the WeIO project a few months ago when they launched their indiegogo.com crowd funding campaign and earlier this week they officially launched their platform. Their goal is to help makers, developers and hobbyists build IoT based applications as easy as possible - using the same technology used to build websites. 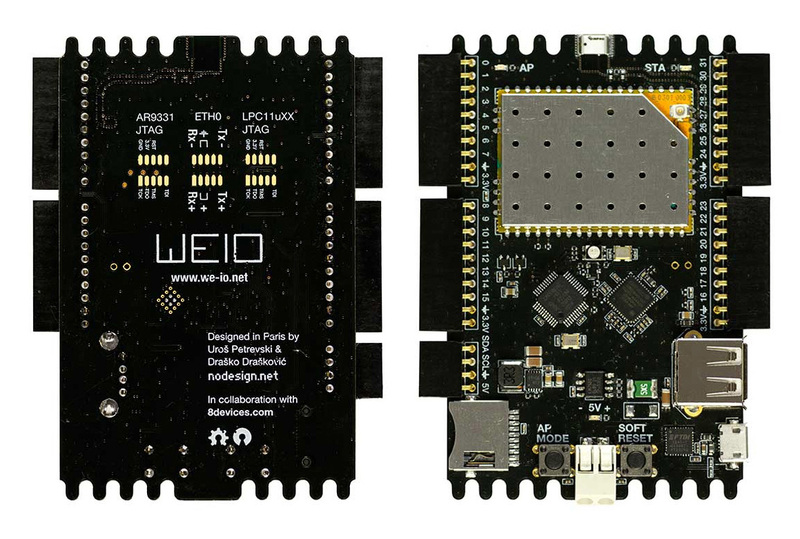 Internally it has an Atheros AR9331 CPU (similar to Arduino Yún) that provides 32 GPIO ports (8 analog, 6 PWM) in addition to offering the standard SPI and I2C protocols for communication with a built in SD card and an on board USB host. The WeIO platform can be programmed using HTML5 via a web browser. It opens up opportunities for developers who may not be comfortable programming in C/C++.